The ethnic Kazakhs in Bayan Olgii, Western Mongolia, partake in the ancient sport eagle hunting (i.e. falconry), using captured eagles to hunt for fur animals. Falconry has taken place on the steppes of Central Asia for thousands of years. There are petroglyphs from the bronze age (c. 2500 BC) which depict this ancient sport. The Secret Histroy of the Mongols mentions Genghis Khan catching an eagle for his father, and Marco Polo writes of Kubilai Khan going on massive hunting excursions with the use of eagles and falcons. In communist times, falconry declined in popularity as nomads were forced onto collectivised farms. The sport, with its independent and individualistic nature and the Central Asian tradition it evoked, was discouraged by officials bent on promoting community sports and a Russian historical narrative. The sport almost disappeared completely in Kazakhstan, but was maintained by ethnic Kazakhs in the border regions of China and Mongolia. Today, hunting with eagles has enjoyed a resurgence in popularity by a people keen to reclaim a cultural identity that was long-suppressed under seventy years of communism. The intense foreign interest in eagle hunting has further prompted ethnic Kazakhs to proudly grasp this unique aspect of their heritage. Urban folk from Olgii city are as keen as foreign tourists to photograph and pose with these magnificent birds. Eagle hunting is also increasingly popular back in Kazakhstan and Khyrgistan. Other Mongolian ethnic groups don't seem to practice eagle hunting much, despite the fact there are plenty of eagles throughout Mongol-dominated provinces out west such as Zavkhan and Uvs. 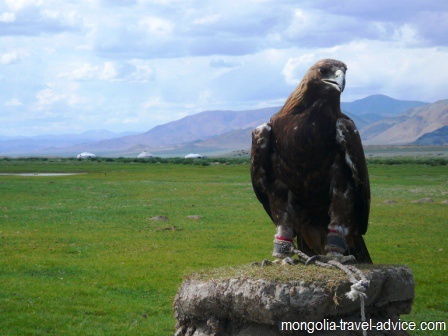 Mongolia exports a number of eagles and falcons out to the Gulf states in the Middle East, where falconry remains a popular pastime for the privileged. An eagle hunter, wearing the traditional fur hunting hat. The Golden Eagle is one of the most common eagles in the northern hemisphere. The species is distributed throughout the higher latitudes of Asia, Eastern Europe, and the Middle East. The bird is also common on the east coast of the Americas. The golden eagle is the national animal of Mexico, Kazakhstan, Albania, Germany, and Austria. The eagle in Bayan-Olgii is of the 'Altai' sub-species, endemic from the Altai moutains to the far eastern Siberia. The eagles mate for life, and nest in rocky crags. They are known for living in the moutains, but we saw hundreds of them on a trip through the dry grasslands of nearby Zavkhan province. Most commonly, some meat is laid out as bait and a net is set, to be pulled with a rope by the eagle hunter, who is looking on from a distance. This is most effective when the eagle hunters already have a tame bird, which they can tether near the meat to act as a decoy to attract other eagles. You might have once seen an eagle engorging itself on a carcas to the point where it can barely take off to fly away when you approach. On sweltering summer days when the marmots are out in number, the eagles can overfeed to the point where an eagle hunter on horseback can pursue them across the plains. The eagle keeps landing and taking off repeatedly, and can eventually be riden down past the point of exhaustion, and captured. One can climb up the rocky crags and find an eagle nest and capture a chick. This can be hazardous, as one of the adults eagles could swoop hard enough to knock the climber down form the cliff. Furthermore, many hunters say it's preferable to catch an adult than a chick, because adult birds are already accomplished hunters and a chick cannot be adequately taught by man. Hunters prefer female eagles because they grow bigger and more powerful. Once the eagle is caught, it is 'broken in' by putting it on a perch and tethering it so that it falls every time it tries to fly away. The bird eventually becomes so exhausted that it will feed right out of the eagle hunter's hand. This may all be a bit distasteful to the modern animal welfare activist. On the bright side, eagles live for up to 30 years, and most eagle hunters in West Mongolia traditionally release their birds after 8 years (though admittedly i did meet a few who found it hard to let go, supposedly in fear of other hunters catching the vulnerable bird). An eagle hunter I met told the story of one of his friend's eagles, which was honorably discharged after 8 years of service. Years later, the hunter was out riding with his friend, and they looked up and saw two eagles circling high overhead. The hunter said, "that's my eagle." His friend scoffed, but the hunter gave a high-pitched whistle and, sure enough, the bird came down and landed right on his arm! 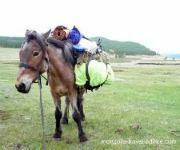 This hunter's summer ger was on the road between Olgii and Ulaanhus. Note the little leather hood over this eagle's eyes, and the leather glove worn by the owner. Eventually, every newly-trained eagle will have its moment of truth out in the wild. Eagle hunters usually try to take along an experienced eagle, which the newer bird can learn from. The hunt only takes place in winter, when the wolves, foxes and rabbits are in their best fur. [Those contemplating heading to the Eagle festival in September/October should take note of this inconvenient fact -more on this later]. The eagle hunters will ride out with their eagles blinded by a little leather hood. They will be wearing thick leather gloves with which to hold the eagles and protect the wearer from their sharp talons (my fiancee has a scar on her arm from the time an eagle climbed down beyond her glove!). The blindfolden bird will naturally climb to the highest point, so the glove needs to be held aloft. Because the eagles are so heavy, the eagle hunters ride with a little wooden crutch which supports the bird-carrying arm and raises it up from the sadle. The eagle hunters will ride up to a high peak overlooking a wide valley. Out in the Altai Mountains, you really can see for many, many miles from these peaks. Often one of their young sons will be sent to ride down the valley to flush out the game from hiding. Rabbits and foxes are the most common targets, but some hunters will risk their bigger birds on more dangerous prey such as wolves and small deer. Once the game has been spotted, the hood is lifted from the eagle and 'voosh'! : off it flies down the valley. Unlike falcons, which plummet down at breakneck speed and (you guessed it) break the neck of their prey, the golden eagle glides down at an alarmingly sedate pace and tackles its prey to the ground, relying on its own brute strength to overpower the animal and emerge on top after the tumble. Nervous that any struggle may injure their birds, the eagle hunters will ride up quickly to dispatch the struggling prey. The lungs of the animal will be fed to the eagle as a reward. The skin of the animal will be used for clothing or bedding, or sold to fur traders in Olgii. Me, indulging in some touristy pics. A fully grown eagle is darn heavy to hold up! For those wanting to see the eagle hunters in west Mongolia, remember that you can see an eagle any time, but authentic hunting experiences can only be had from November to February. In summer, understandably the most popular time with tourists, the eagles do not hunt. However, it is easy enough to see an eagle, you can simply ask your guide to take you to one he/she knows. Any Kazakh tour guide worth their salt will know of a local hunter somewhere nearby, or you might spot one tethered outside a ger as you're driving past. 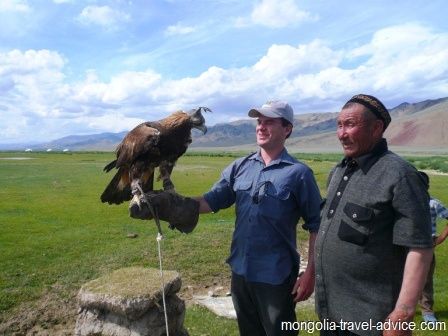 Most eagle hunters are aware of the draw their birds have with foreign tourists and Mongolian townsfolk, and many will ask a fee of about $5 US dollars or so to pose with it and give you the opportunity to hold one yourself and get some photos. It's quite worthwhile and it doesn't feel 'tacky' or too touristy just because a handful of other people might swing by each year to do the same thing. 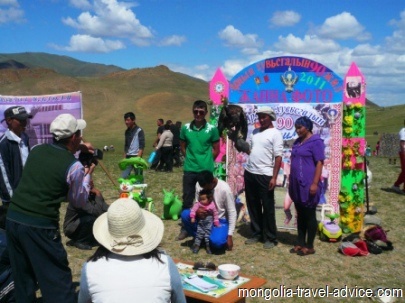 Eagles are also quite a drawcard with locals, too, and at local nadaams in Olgii you will often see vendors charging for photo ops with eagles that I suspect are for the sole purpose of earning tourist dollars. The Golen Eagle festival, or Altai eagle festival, in Bayan Olgii takes place in late September or early October each year. It should be noted that the festival is not an ancient tradition, but something set up in the last 15 years in the aim of attracting domestic and international tourists. It has, however, been very popular with both Mongolians and foreigners alike. Those expecting to see eagles 'hunting' at the golden eagle festival will be dissappointed to see the hunting demonstrations consist of a fox skin being dragged on a rope behind a horse. For these reasons, many of the bona fide eagle hunters won't deign to turn up to the festival, and tourists planning a trip out west for the sole purposes of seeing this festival may feel a little dissappointed. But really, who ever heard of a 'hunting festival'? Bring a hundred tourists together and any flighty game animal with half a brain is going to run for miles! For an authentic eagle hunting experience you will need to go in small groups. However, the Golden Eagle Festival still has its drawcards; I just want to ensure you have accurate expectations. On the bright side, you will get some great photos of eagle hunters carrying their birds and wearing traditional clothes. You will get to see eagles in action on time trials, and there are even camel races and Buzkashi to witness. Sure, it might be a bit 'touristy', but there will be more local tourists than foreign ones, and what a nice experience to see Mongolians out and about, and experiencing a buzzing atmosphere as locals and foreigners alike take an interest in witnessing this fantastic heritage. The choice is yours. 2016 SEASON NOTE: The Eagle Festival is getting incredibly popular. In 2015 all flights to Olgii were booked out 5 months in advance when it's on. 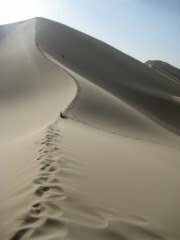 So if you want to go to West Mongolia in late Sept/ Early Oct, book now. As in, NOW or you may be disappointed! 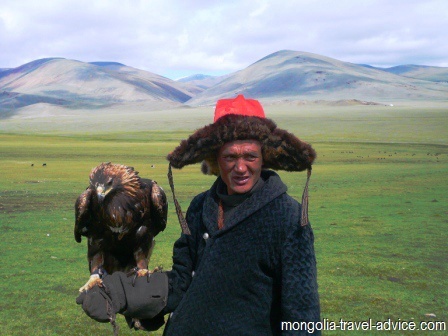 Locals discovering their own traditional culture, being photographed with a Golden Eagle. If you come to Olgii between October to February, and are in a small group, you will have a good chance of seeing a real eagle hunt. Witnessing a real hunt will without a doubt be one of the highlights of your trip! 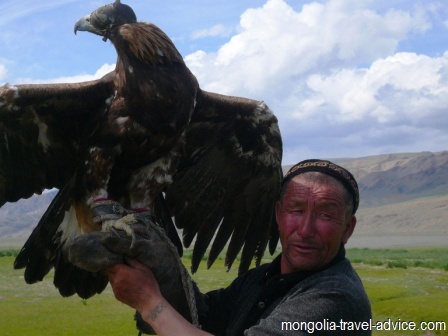 Get in touch with a good Kazakh tour operator before you arrive in Olgii, and tell them you want to see eagle hunting. It is only fair that you will pay the hunters some money in return for taking you out hunting. Hunting takes patience: you might have to put up with hours of cold and discomfort before you even see a single animal. But eventually, it will happen, and it will all be worth the effort. You'll be sitting up on a hill, and one of the hunters will pick out some game in the valley below (a pair of binoculars will be a great asset!). make sure you don't yell out in excitement when you see an animal, as I've heard some tourists have managed to scare the eagles, and alert the game animals to the presence of danger from above. For anybody visiting west Mongolia in winter, this is surely a highlight that cannot be missed! Good luck!